On House last week, the characters were arguing over what disease the patient had. One of the doctors had all these reasons why it was a certain sickness, and the other doctor had a reason why it wasn’t. House walked in and said ‘It doesn’t matter how many reasons you have for something, it only takes one reason against to change your mind’. And that’s what happened to me. I had so many reasons why I would stop buying magazines. Saving the environment, saving my money, sick of repetitive content. 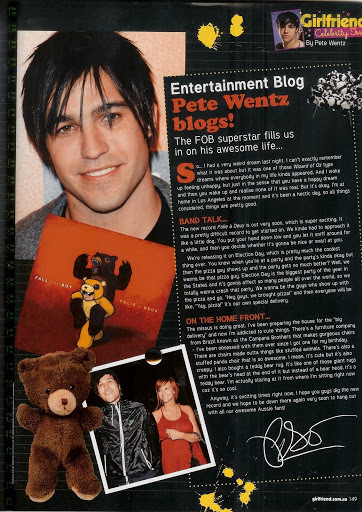 But then the new gf had a picture of the JoBros on the cover and the promise of a Pete Wentz blog. And I bought it. It surpassed all my expectations, because you know what? It was actually quite awesome. Amanda Bynes has been on so many magazine covers this year, it’s not funny. Well, maybe I’m over exaggerating, but she has been on a few. She looks gorgeous on the cover of gf this month, sporting lots of necklaces and rings, a blue shirt and wavy hair on what looks like a beach. The main font colous are fluro orange, a dark aqua and pink. It gives an overall pretty, summery look. No offence to Sarah Cornish, but the picture that accompanies her letter this month is not flattering. She’s standing at an odd angle with a seemingly forced smile on her face. Oh well, her actual letter is good, just rambling about the celebrity made issue and how it’s not just a month of relaxation for the team. The customary cover girl feature was amazing this month, but maybe I’m being biased. I love Amanda so I love reading about her, however when they ran Miley a few months ago, I barely payed the article any attention. In the interview, Amanda reveals she still lives with her mum. She seems so down to earth. How to know when to shut up. This feature was written by radio presenters Tim Lee and Carla ‘Biggzy’ Bignasca. It’s a very cool article about how to know when you’ve said too much, and what to do next. 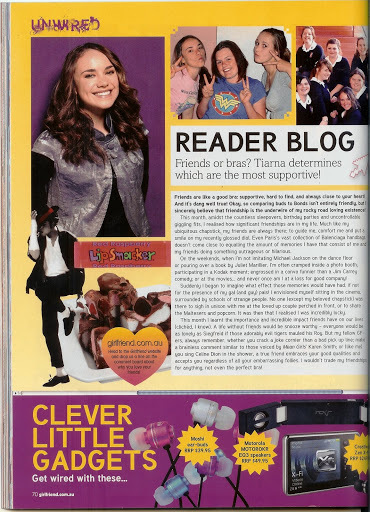 This is my favourite article in the magazine. In fact, it’s one of my favourite articles ever. It was written by Rebel Wilson who wrote and is staring in Bogan Pride, which is currently on SBS, Monday’s at 9pm. The feature is about being a bogan, and being proud of it. Rebel shares her best bogan fashion tips, stories about her boganess, and how we should all get out there and just be bogan. This article pretty much makes buying the magazine worthwile. By Maz Compton. 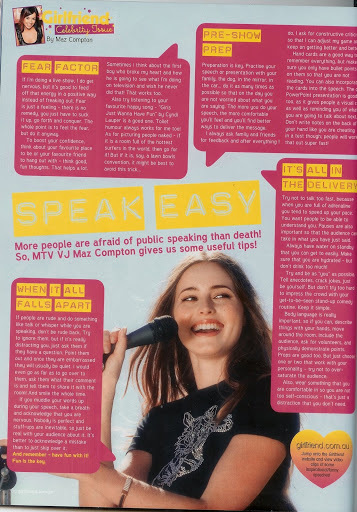 I love public speaking (and speaking in general) so this article full of public speaking tips was perfect for me. Plus it has an awesome layout. What’s not to love? 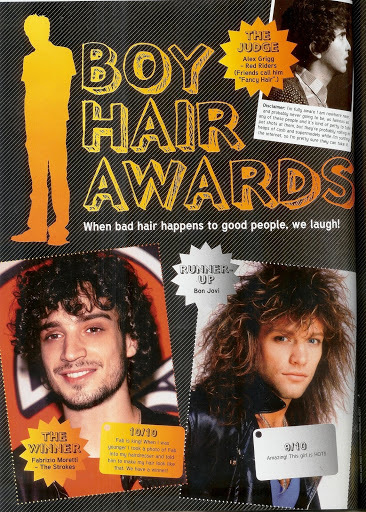 This double page spread looks at the hot, and the not so hot of boys hair. 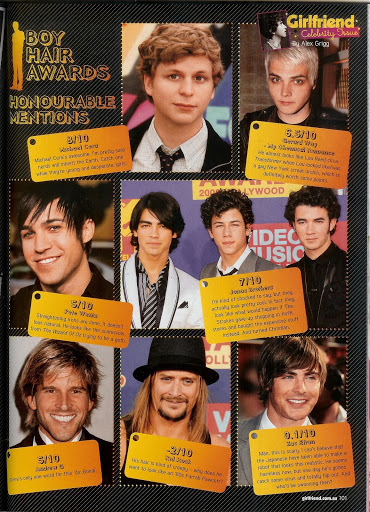 JoBros get a 7/10, Fabrizio Moretti from the strokes wins and Kid Rock comes in dead last with a -2/10. ‘Nuff said. This ‘blog’ is so rad, he talks about FOB and (very) pregnant wife Ashlee. He is so hot. GF Loves (with Ryan Shelton). It all makes sense. I now realise this very page was where I most recently sighted Dr Horrible’s Sing Along Blog, before actually seeing it. It’s the number six love this month. So coolios. I’m sorry. I just don’t like Tiarna’s blogs. Although this months is a vast improvement on past columns, I’m still not feeling it. This month, she (breifly) compares friends to bras, and then talks about friends. Also, she includes some pics of her and her friends, and it shows how photo-shopped her usual blog pic is. This one’s by Scott ‘Dools’ Dooley. His usual Guydance column is always plagued with rudeness and sarcasm, and this article is no different. I mean, isn’t it half obvious that guys don’t like Hannah Montana and tampons? We don’t need to be told. As much as I love whales, and want to save them, do we really need a double page spread on it every second month? 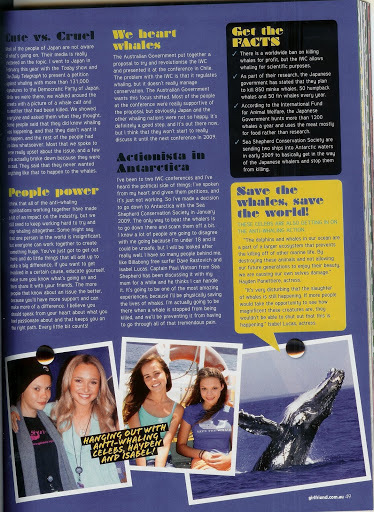 This months was written by teen whale activist (and past winner of gf of the year) Skye Bortoli. The fact that the magazine’s December issue came out in October. Just a minor pet-peeve. For once, there’s only four things on my ‘not so coolios’ list. Free gifts were an eyeliner (I now have so many gf eyeliners from various issues, which would be useful, if I wore eyeliner.) and a 15 page beauty book which you flip the mag to access. Overall, I give the issue an 8/10 for it’s laughs, cool layouts and awesome featured celebs. Girlfriend is moving up out of it’s rut, and I will be excited to buy the next issue. you had me at “it was actually quite awesome”. i’m buying it as soon as it hits stands here! haha.